This candle is available in two different scents, meaning you can choose the fragrance to fit the couple, rose is the flower gift for a 15th anniversary and vanilla is a timeless scent. 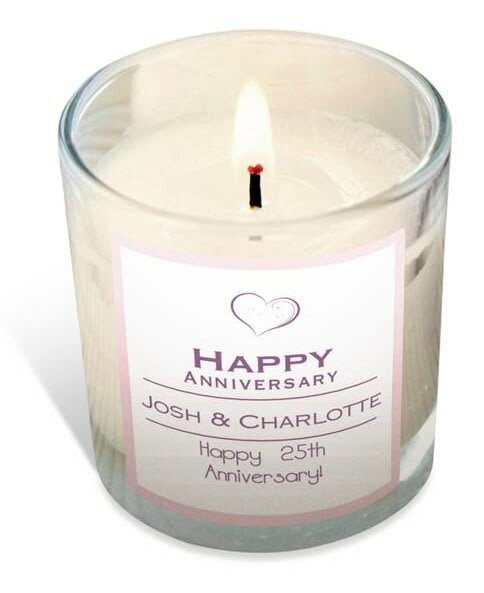 With their names and your message included in the simple design, whether it's a milestone anniversary or not this gift is ideal. Also available in Vanilla, they're sure to love this little gift. To wish a Merry Christmas to a loved one or a well fragranced Secret-Santa gift, this candle is an ideal present this festive season.